As most of you know, tacos are one of my favorite foods! When I’m looking for a lighter alternative with tons of plants, I turn to my Turkey Taco Bowl. It is filled with loads of filling protein and fiber, is totally delicious, super easy, and extremely versatile. You can literally throw in whatever you have on hand. I love to use tons of beautiful colors and textures. I hope you’ll give my Turkey Taco Bowl a try and let me know what you think! Don’t forget to post pics of all your food creations and tag @livlight_ and #livlight. Heat skillet over medium-high heat and spray with 100% oil spray (I use avocado or olive oil). Add turkey and brown until cooked through. Add taco seasoning and sprinkle with salt and pepper, to taste. Remove turkey and set aside, rinse skillet, and place back on medium-high heat. Spray skillet again and add riced cauliflower. Cook until slightly browned and add the juice of ½ a lime and cilantro. Remove from heat and set aside. 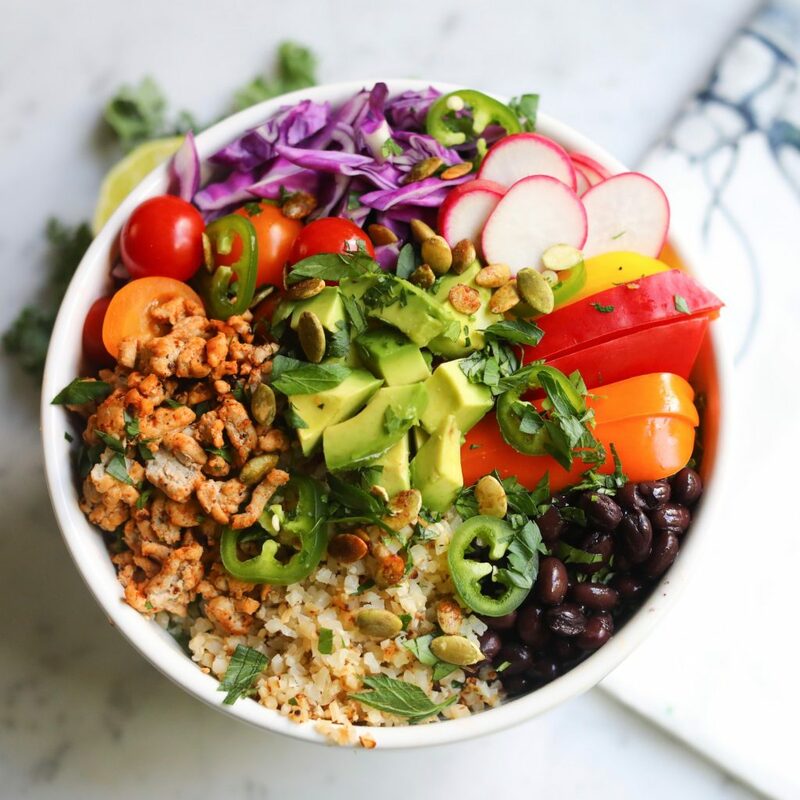 To build bowls…add half of the kale to each bowl and top each with half of the veggies, turkey, cauliflower, beans, and avocado. Sprinkle with thinly sliced jalapeno, extra cilantro, and pumpkin seeds. Sprinkle with other half of lime and serve.